I met a friend for lunch the other day at SoBro Café. It’s the beginning of the year, and like so many, I may have overindulged a bit over the holidays, so I am looking for places where I can still eat out and be somewhat healthy. SoBro Café sort of seems like one of those kinds of places. Because you know I am not giving up going out to eat. I ordered the mushroom skillet ($10.49), which was fried potatoes on the bottom and was topped with sautéed mushrooms and onions, two eggs, goat cheese crumbles, and diced tomatoes. Before you say, “hey, fried potatoes aren’t very healthy,” I will say I only ate like two of them, just to try them. 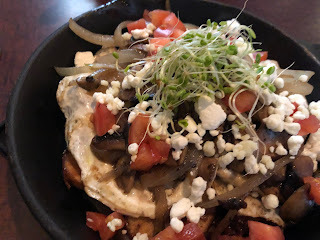 I really liked the flavor of the dish—they used some truffle oil on the mushrooms, which some people get all worked up about, but I don’t mind its use in moderation. I love truffles, and the essence of it was a nice add. The mushrooms were cooked well, and there were lots of tender onions too. For some reason, I spaced telling them how I wanted my eggs cooked (and they didn’t ask), so they were a bit overcooked, but honestly, I will eat an egg just about any way, so I was fine. But next time I would ask for them over easy. I loved the kick from the goat cheese and the acid of the tomatoes. It was a nice combo. And wasn’t too bad health-wise, since I didn’t eat the potatoes. On that subject, I wished they had been a little crispier, but if they were, it probably would have been more of a temptation, so that was ok.
My friend ordered the “shrimp po bro,” which was their take on a po boy. 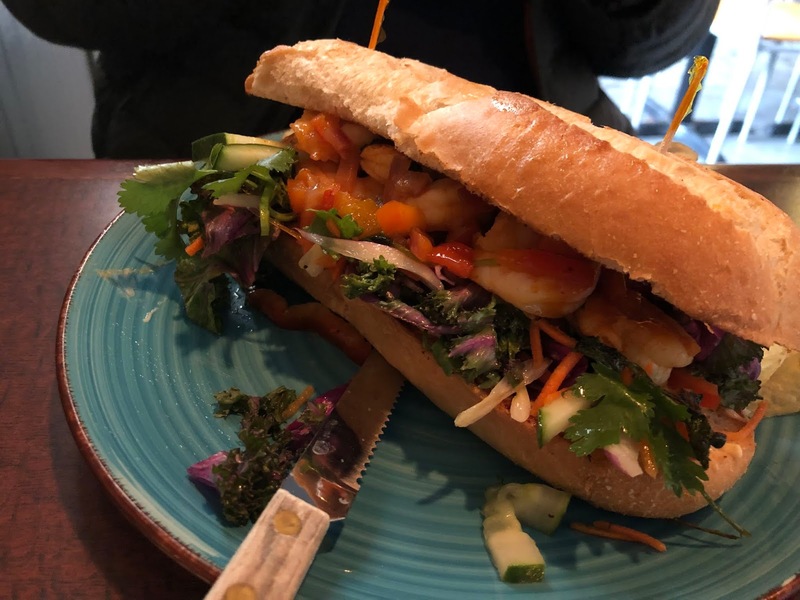 Shrimp was not fried, which added to the healthy aspect, and it was served on a hoagie roll with kale slaw, and a tangy remoulade sauce. They say it had an Asian twist, and I will agree. I thought it was good, but the bread was a bit big for the sandwich. I liked the acidity of the sauce on the sandwich though, and the shrimp were cooked properly. All in all, I would say that I was able to meet my needs to go out to lunch and eat fairly healthy. I like that you can order off the brunch or lunch menu, and I like how warm it was in there on a very cold day. I was sad not to order the biscuits and gravy, which I love, but again, trying to stay healthy, right? What are your favorite go-tos when you want to try and stay a bit on the healthy side for lunch but you still want to go out?